It’s amazing to me that this is our third year of Mosaic. I’m in awe of all that has developed and unfolded. I take a lot of pride in everything I do, and embarking on this journey to create a school was a huge step for me. I am shy to show anyone work of mine that isn’t fully “finished,” for example, my writing, art, or even a complete thought! But doing something on this level means that all along the way, people are exposed to what is developing – because it’s impossible to start a school and have it be “perfect.” In the beginning, you don’t even know who your kids are. How can you develop a system that serves people you don’t know? You can lay down the foundation, philosophy, and broad framework (our Agile Roots), but the details of how it will play out are always in development based on who you are working with. And that changes. You find that you can’t serve some, but start to understand who you really can serve well. It’s been such a learning process over the years. This week, all that hard work felt so good. I feel myself on the top of the mountain, able to look back behind me and see how every moment led up to all the understandings I have now. I can see ahead of me and the direction we are going, and it looks glorious. We had three days of school this week and they were amazing. 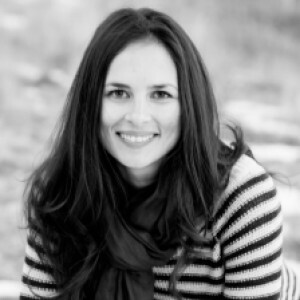 We got into a groove right away, and @jesslm & I feel clear about acting from a place of trust for children, completely, while also understanding that our roles as facilitators at school mean that we will influence and affect the environment at school. At other free schools you may have adults pretending that’s not the case, but it’s impossible for this not to be true if you are developing meaningful and loving relationships with those around you. Below, I’ll share some specifics about some changes we’ve made at school, my Spawn Point experience, and give a general first week reflection. Books: we decided to opt to visit the library more with kids rather than store lots of books at school. It was hard to keep them organized, so kids really didn’t go through them very much. I think it’ll be better to go to the library intentionally to select books, and then along the way, use the library’s organization and nice displays to guide us to select a book that we didn’t intend on getting. Or ask librarians for help and suggestions! We have a library in walking distance, so this is easy to do. Baskets: I tried to replace as much plastic as I could with baskets. Micheals had a 50% off sale on baskets the weekend before school started! For $40 I got a bunch of nice baskets and I feel so happy when I look at them in the room! Plants: I got one little plant donation. I hope to get a few more, but will wait to see if I keep this one thriving. Jess got a bunch for her room, including a fern I can take a clipping from to grow in our spawn room eventually. Our little plant is tiny, but it also brings me joy to look at. Removing cubbies from hallway and adding hooks: This has been huge! The hallway presents so much nicer now, and things are off of the floor. @dthomasson then re-used the old cubbies to make awesome shelves in the Quiet Room & Cloud Room! Personal cubbies: We added these for work-in-progress, books, etc for kids in their Spawn Points. The last bullet is the really the fun part for me. I have known most of these kids now for at least a year, and some almost three years. There is a lot of trust and respect already established between us, so the past three days we’ve been able to do some really neat and fun things together to start and end our day. I do feel comfortable asking them to try out some new things, but always from a place of working with them (I actually ask them for consent to try out new ideas). So I’ve been having fun asking them to try out some different ways to reflect on their day visually and set goals for themselves. They know I’m just showing them different tools – later they can decide if any of these tools work for them or not. They can ditch ones they don’t like, build on or evolve ones they do, or invent new ones as they go! All the tools serve the purpose to support them learning how to understand themselves better so they can better manage their own time and learn how to make decisions for themselves that feel good. Each morning, I laid out mandala coloring pages as a gathering activity for kids coming into school before our official 9:30 start. @tomis shared a neat article with me about how coloring is the best alternative to meditation after he saw us coloring each morning. I shared that with the kids and they really liked hearing that what they were enjoying was good for them too! This helped the kids settle-in and the atmosphere feel calm. 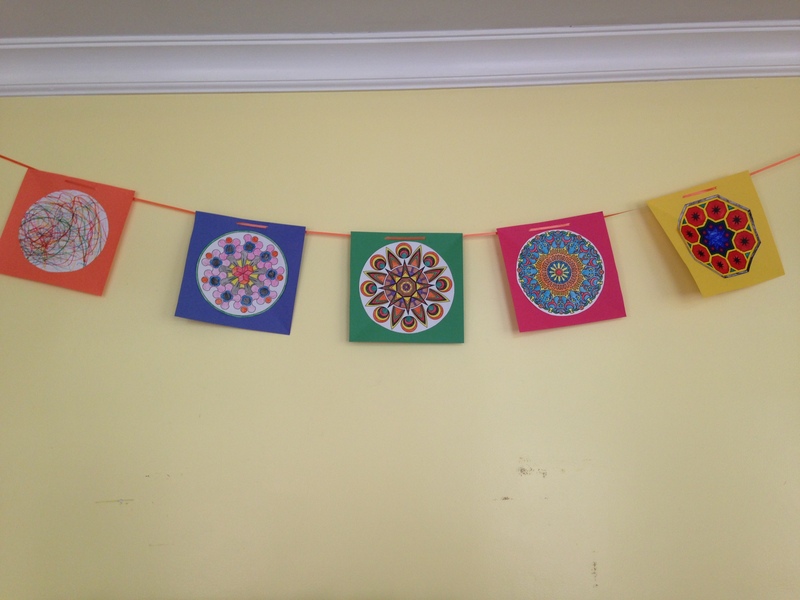 I also used our mandala colorings to decorate our space. I’ve got enough finished mandala colorings to make a second banner too! Wednesday Morning (35ish min): We focused on just getting acquainted. @jesslm made a game for the adults to play at our community meeting. Everyone loved the game, and we decided to do it with the kids in our Spawn Points. The game simply use a board, die, pieces, and question card to move a group along in asking each other questions. The only point is to get to know each other! The kids loved the game and a group asked to play again later that day – spending over an hour to play later than afternoon. Wednesday Afternoon (20ish min): We reflected on our day and moved stickies or wrote stickies to add to our Done! 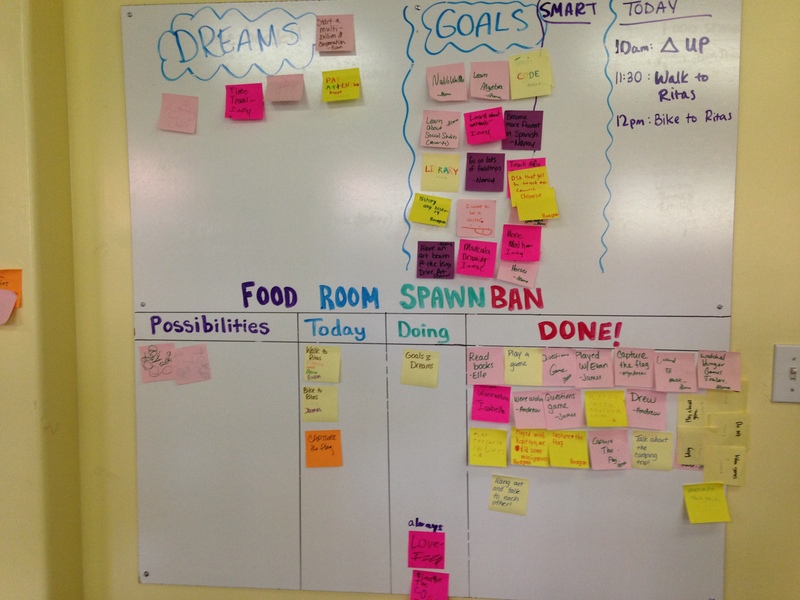 column on our Spawn-ban (what we call our Spawn-only kanban). Then I asked the kids to share any dreams for their lives that they had. They added those to stickies on the board above our Spawn-ban. Thursday Morning (30ish min): We added intentions to our Spawn ban as the kids are used to, and then I initiated a conversation about what makes a goal different from a dream. I used the example of going to the moon – was that a goal or dream? This was a dream that involved many different goals to be completed along the way to be reached. 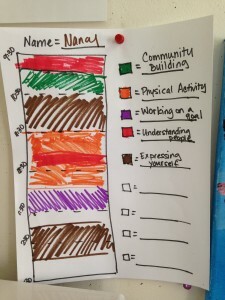 One of the students chimed in that his dad has a dream to open his own gym, but there are lots of things that he has to do in order to get there. I gave the kids the concrete example that this child’s dad might have a goal of “saving $15,000 by the end of the year” so that he could put a down payment in on a space. 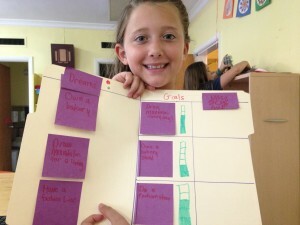 I wanted to help the kids think about what made a goal different from a dream, and lay the foundation for later setting some really specific SMART Goals for themselves. After we discussed this, as a group, we read over everyone’s dreams that were written up the previous day and sorted them as either a dream or a goal. I kept this simple and did not go in-depth about SMART Goals. I just added that a dream is probably something that will take longer than this year to do. The stickies that could happen this year might be goals that one could set for themselves. Thursday Afternoon (15ish min): I decided to experiment a little on this day. 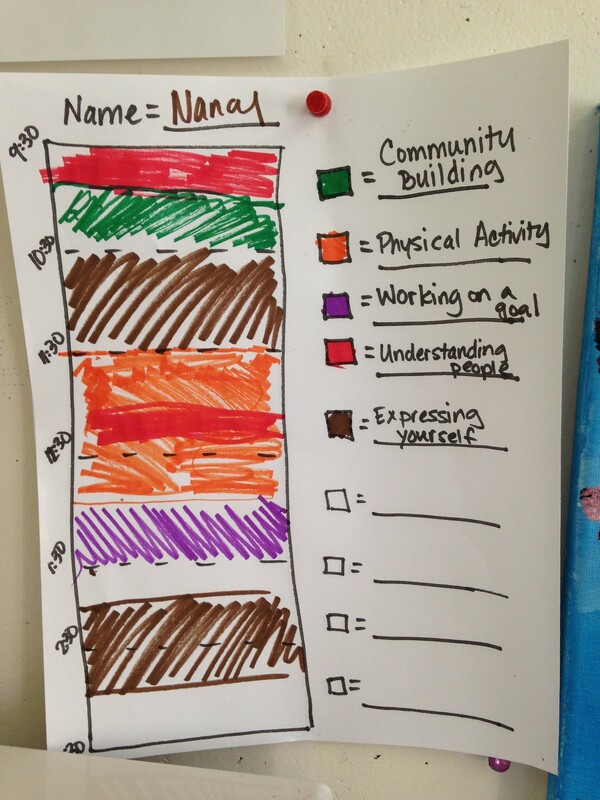 Over the summer @leigh did this using a plate to help kids reflect on how they spent their time. The plates were divided into the categories “movement,” “understanding people,” “making things,” “expressing yourself,” and “how things work.” At the end of camp, the kids thought about everything they did that day and added a sticker to which category they felt their activity fell into. Many could fall into more than one category, the point isn’t to place it into the “right” category – there is no right or wrong in this activity, the point was to just do a deeper reflection on your choices for the day. By simply thinking about whether you were “understanding people” or “moving” during your dance class involves you to engage with your reflection for the day at a deeper level. The kids who did the plate activity in a Spawn have already asked if we could do it again. I could tell they liked having a very visual and concrete reflection, and asking them to do a different type of visual concrete activity was easy. I asked them to fill out a worksheet that was color coded. I wanted them to think about the hours of the day and color code how they spent each chunk of time. I opened by asking the kids, “Do you know that all of you did the first item on this list today?” They looked confused and were quiet for a moment. Then one of them said, “Oh! Change Up meeting!” I told them that what students do at ALCs is something so important: kids here actually work together with the community to create it. We come together EVERY week and try out new things to make our school better and better – with input from everyone in it. This is not something that every child gets to do. Kids here get to learn how to create the culture they exist in, rather than how to deal with a culture they don’t want to exist in. To me, that’s way more important than sitting through history class. The kids did not have to use my categories, those were just examples. They could write their own. One student put color coded smiley faces in each section because she felt her items that day covered more than one category. One student felt stressed out about the whole activity and asked not to do it – to which I said, “Of course! Please don’t stress over this. I’m just trying to introduce a tool that might help some people. Some of us might never do this again. Some may like it. Are you willing do something quietly though so other could try it out? Or just listen and watch?” This felt perfectly fine to the student, who seemed quite happy to continue coloring his mandala anyway. I loved that this came up as an example for any of the kids to jump in and express their opinions or thoughts about trying this out. It builds trust to see how I react – will I get upset of someone doesn’t like my idea? Or will it not bother me? Always, I want kids to feel safe to respectfully decline an idea I think is cool! Again, when you have a relationship with the children you are working with, you can just ask them if they are willing to try something out that may help them. They know I’ll never make them do something continually that they hate – they know I’m trying to support them in having an awesome school day and an awesome life. They respect me and seem think I have good ideas for the most part. They also know that they can just talk to me if something I ask them to try feels uncomfortable to them and I’ll respect that. Friday Morning (30ish min): I introduced new folders to organize each individual student’s goals and dreams. The kids were asked to take down their stickies from our group board and put them in a file folder that was divided into sections. I introduced simple system for each child to indicate how far along they felt they were in their goals with a little bar system. They could draw a rectangle and then divide it into sections and fill it up as they go. I love this because it’s really foundational math – look at a whole, are you half way there? A quarter of the way? Can you split up a whole into equal parts? What does that mean? The time activity from the day before also hits up fractional concepts too. This is how math is concretely developed in a way that makes sense to humans. Math is everywhere. We’re always learning it. In school, many times, kids learn that math is this strange thing that simply doesn’t make sense. They learn that math isn’t all around us and can’t be related to our lives in a way that makes sense. Not every kid used the bar system, and that’s okay. This was just a first step to breaking a dream down into a goal. In the coming weeks, I hope to really help them take each of their goals and dive into it further to make more specific and attainable steps within the goal (SMART Goals). I also hope to help them dive further into their dreams – the How and the Why? Asking “How?” helps to develop goals, but it’s important to ask “Why?” This can help a person become more connected to their dream when it gets tough following through on a goal. Or it can help them realize that this dream was just a dream but not one that’s actually a priority, and that’s cool too! I gave the kids this example when doing my board: I had in my dreams section, “Learn Spanish fluently.” But when I asked myself, “Why?” I realized that my dream was to actually live in a foreign country for a year in the future and be able to speak to the people in it. Then I asked myself “Why?” again and realized that I want to do this because learning about how other people live in different cultures or time-periods fascinate me. 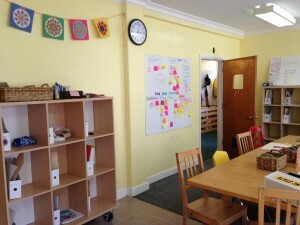 Friday Afternoon (35ish min): The kids blog on Friday afternoons. I asked kids who were willing to put a picture of their goals and dreams in their blog. Some did this so they could mark this on their first week and see how their goals and dreams change over the year. Some didn’t and just wanted to keep that private. Either is fine. The point isn’t to make all the kids do the same thing. Some of the kids really dig the extra tools and seem excited to keep trying new ones out. Developmentally, some of the kids are really doing what they need to each day through free play and spontaneity and don’t need the tools. However, they can still be supportive of the kids who do want to use those tools. Each day, I felt energized and happy at the end of the day. That’s how I am going to continue to imagine feeling after every school day this year! It was a really fantastic week. I felt there was also a healthy and normal level of conflict that occurred as well. When you gather 25 people into one building for 6 hours this happens! Through our challenges and joys we learn to live and learn as a community together. What’s different from unschooling in an ALC and unschooling at home is that you must buy-in to being around other people and problem solving with the group to be here. This is why I so strongly support both homeschooling along side schools like our ALCs. It’s important to evaluate each child’s needs and desires to do what’s best for them. All week I observed kids engaged in activities like capture the flag, board games, ping-pong, biking, dramatic imaginary play, research & planning, playing Minecraft & Terraria, playing Werewolves, reading books, coloring, drawing, and more (please visit this album for pictures of our week!). I saw kids getting along beautifully, I saw kids having struggles getting along, I saw kids talking to each other, I saw kids asking for help to talk to each other. We had enough adults and kids at school so there was space to talk out problems as needed. There are still more community wide awarenesses we need to discuss as group too. If you can do these things, you can learn anything you want in the world. AND everything you learn will be connected to what is relevant and necessary for you to lead a happy and fulfilled life.